Oceanfront Gorgeous 5BR, 4 Bath, Panoramic Ocean Views !! Please CONTACT OWNER (Scott) BEFORE attempting any online bookings. 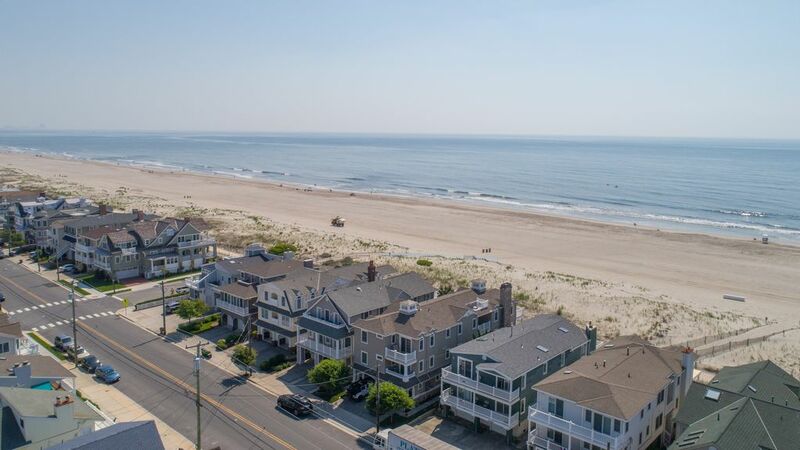 Owner has multiple 4BR and 5BR oceanfront properties in the Southend of Ocean City at various price levels - so call or email for availability - DO NOT fully rely on the online calendars. Peak season rentals are from Saturday to Saturday. Panoramic ocean and beach views. Located on the desirable Southend beach at 44th & Central, this newer home features over 2000 SF of living space, with 5 Bedrooms and 4 full baths (special variance granted for additional SF, compared to the majority of other area beachfront homes that are less than 1600 SF) It is the largest home on the block with incredible panoramic views. This top floor/Upper level home also has an extra large elevator in addition to private interior stair access. Enjoy tasteful and beautiful furnishings and fantastic upgrades. Your family will have plenty of room with 5 BRs, 4 full baths, multiple decks, a fireplace, hardwood floors, a beautiful open floor plan kitchen with large center island and stainless steel appliances (gas range, dual d/w, extra large sink) and dining table seating for 12 people. A large 50" HD TV is provided in the living area, along with additional HD TV’s in most bedrooms as well as DVD player and wireless internet. There is a large oceanfront deck to enjoy the ocean breezes and plenty of parking and storage. Other features include private ELEVATOR access, ground level foyer, full size garage with extra full size refrigerator/freezer, an enclosed beach level private cabana shower with 4th full bath, additional off-street parking, and central AC. Additional reviews and references upon request. One of the most panoramic ocean views in the Southend of Ocean City. House sits higher and closer to the ocean than all neighboring homes. Miles of ocean views from inside the home. It's a great rental property for a long weekend in the off season with family & friends. The views are amazing and the house is well kept. we will be back again. Well furnished and cozy. We hosted a thanksgiving dinner/ long weekend here and appreciated the well furnished kitchen, extra fridge and large table for dining. A perfect spot for a weekend getaway for our family to take our ninety-year old, wheelchair-bound, mother. The elevator was key, and the deck was a wonderful place to sit for an expansive view of the beach and ocean. Modern and plentiful appliances in the kitchen, beautifully decorated, spacious and functional. Very homey and comfortable for all nine of us. Would love to stay again! This property exceeded every expectation! Clean and modern amenities made for the most relaxing long weekend stay for our party of four adults. I can't imagine any property on the beach in Ocean City that could top this location. Great communication with the owner and simple easy access to the property rounded out the fine details of this wonderful rental. We had a wonder stay! The home was perfect and the owner was wonderful to work with! We loved everything about the property! Our family easily settled into the home and had a special week. We look forward to many more visits staying in this home!! The views were amazing!! !